Vapor Intrusion Monitoring attempts to quantify the levels of chemicals that are being transported via an aquifer to an area where contaminants can work their way up to the surface and potentially affect the indoor air quality of homes and buildings removed from the original site of contamination. 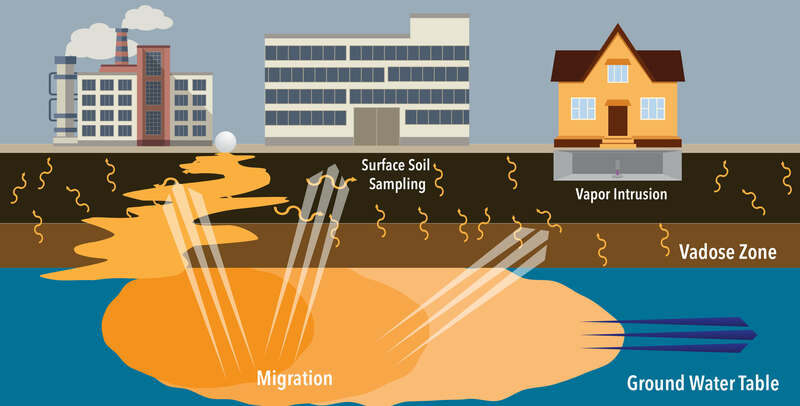 For vapor intrusion monitoring to be accomplished accurately, concentrations in both the sub-slab soil gas and in the indoor air environment need to be determined. Often times, concentrations to be monitored are well down into the sub-PPB range, since many chemicals of interest have a potential carcinogenic effect at even low part-per-trillion levels. Accurately monitoring important chemicals at these levels requires the use of inert canisters and supporting equipment that are verified to contain very low background concentrations. Entech continues to be the only company that manufactures and supports all the products and systems needed for compliance with EPA Method TO-15 sampling and analysis – with demonstrated solutions for accurately monitoring compounds down to 0.005PPB. With SiloniteTM canisters, there is far less concern relating to carry over and memory effects than present when sampling using adsorbent tubes. Normal TO-15 time integrated sampling systems can be used for determination of indoor air concentrations, and Entech has also developed “grout free” sub-slab probes and sample trains that allow a sample to be collected within an hour of arriving onsite. After sampling, the slab opening is closed off in a way that allows re-sampling at a later date without any need to create a new hole in the slab and also produces a flush seal with the slab surface (no tripping hazard for occupants). In cases where helium leak detection is required to verify that indoor air was not inadvertently pulled into the canister when performing sub-slab sampling, Entech has also developed cost-effective solutions that exceed most monitoring requirements. The field sampling engineer can easily test the actual contents of the canister for helium using a simple, portable leak detector and a gas tight syringe. This is far more defensible than just testing a sample train for leaks.